Super thrilled that Pepy of Indonesia Eats agreed to do my first ever guest post here. I can't even recall when was it first that I came across her fantastic site but ever since I've been having an ongoing dialogue with her about her home country's fascinating cuisine. Pepy is thorough and educated in her research and is a fountain of culinary knowledge. Always has incredible suggestions for substitutions due to dietary restrictions. In her recent post she suggested I use katsuobushi, a Japanese smoked fish flakes, made from skipjack tuna, instead of ground dried shrimp asked for in her most recent Palembangese Stuffed Fish Cake With Green Papaya post. But let me take few steps back, I do have much respect for the content on Pepy's site but what grabbed me first was her sense of style. Among so many talented photographers and food stylists her unique photographic vision sets her apart. Pepy's site transforms you to exotic yet accessible culinary world. So it won't come as a surprise to you that she was one of the inspiring Asian food sites in my Blog Awards and Happy Year of the Rabbit post. When she emailed me the introduction my heart was filled with warmth. This recipe was especially developed for me and this site, I am honored. Make your holiday extra special and go and pick up frozen shredded Cassava (Yuca) at the Asian grocery store or fresh Yuca at the Hispanic/Mexican supermarket. Shredded fresh Yuca works just as well and I have seen the root at main stream area supermarkets as well. Without further ado let me introduce to you, Pepy! My fourth guest post for other bloggers. Shulie of Food Wanderings, is such a sweetheart who loves learning other cultures' dishes. Both of us have been tweeting along for quite some time now. I still recalled the day when she told me that she finally found fresh turmeric and how she loves the distinct flavour of fresh one compare to the powder ones. One day, she sent me a DM. . She asked me if I can be her guest blog post. Being a reader of Shulie's tweets on a daily basis, I was kinda grabbing the basic of Shulie's blog. To be safe, I asked her if she needs any special diet for this post. I was a former cook by trade for a commercial kitchen so I'm aware for some different dietary restrictions. This cassava fritter is especially made for Shulie. There are 3 different names that I know for this cassava fritters stuffed with coconut sugar. Javanese knows as jemblem while Sundanese (West Javanese) calls it misro (amis di jero - meaning sweet inside) and the Balinese calls it pulung-pulung ubi. Cassava (Manihot esculenta), also called yuca or manioc, is a woody shrub of the Euphorbiaceae (spurge family) native to South America. There are two names for cassava in bahasa Indonesia, singkong and ubi kayu. Based on my late grandmom's story, back when Indonesia was still occupied by the Dutch, cassava was an Indonesia’s main carbohydrate source and staple food instead of rice because it was affordable. In fact, the Indonesians today will say that they haven't had any meal yet if they haven't eaten any rice. Nowdays, we steam, boil, deep fry, or bake cassava as a snack. I love eating steam cassava with a bit grated coconut or just sugar and salt or my late mom made it a bit fancy by adding cheese and baked. Thank you Shulie for giving me this opportunity. I decided to share a vegan sweet snack that is popular in two islands in Indonesia, Java and Bali. 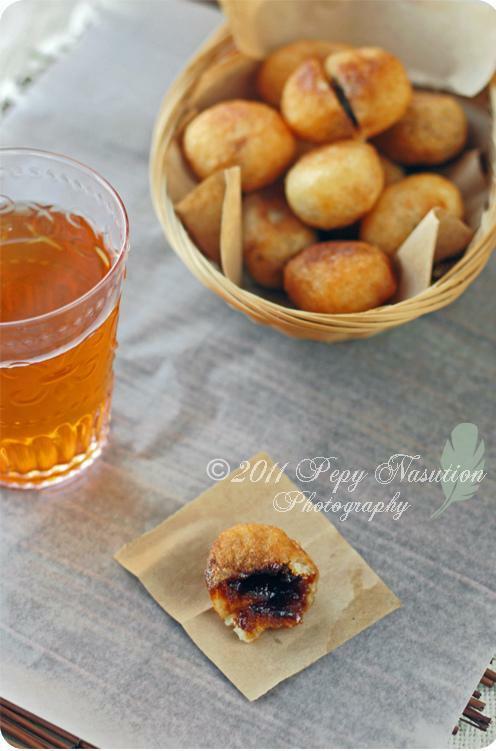 Enjoy these fritters with a glass of warm jasmine tea with no sugar added or kopi tubruk (Indonesian black coffee). Combine grated cassava with salt. Take 2 tablespoons of cassava mixture. Shape into balls, flatten, and place 1/4 - 1/2 teaspoon coconut sugar on the middle. Re-form into balls with filling in the centre to an oblong shape. Deep fry on medium heat until golden brown and done. Drain excess oil and serve warm. I like using brown paper bag to absorb the oil. • I often tell my readers to substitute coconut sugar for palm sugar. I did substitute due to short of coconut sugar in my pantry. However, in this recipe, if you use palm sugar, it will be too sweet and darker. You probably need to reduce the amount of palm sugar in case you substitute it. No coconut sugar? No palm sugar? Don’t worry use regular brown sugar. Indonesian food on Food Wanderings: Padang Fish Curry (West Sumatra, Indonesia) & the 411 on Fresh Turmeric post here. Shulie! So this was what it was:-) So glad to see Pepy's post. Love her blog and her wonderful photographs. Reading through her recipes is like making an exotic alluring journey to a land I would love to visit. Such a beautiful recipe. makes me wanna bite into and close and eyes and feel the inside of these fritters. Happy to see Pepy's guest post! When Pepy wrote, "In fact, the Indonesians today will say that they haven't had any meal yet if they haven't eaten any rice." ~ I can totally relate. A meal would have RICE, and a sandwich no matter how fancy it may be is just a SNACK. Beautiful post! I shall try your recipe sometime. What I'm familiar with is the boiled cassava with grated coconut and sugar. Oh, the memories your post brought back! THANK YOU! Thank you Shulie for having me! Soma, happy to see your comment that I can bring you a culinary journey to the land that you haven't visited yet. Annapet, yes... We are from the same root. Our foods and memory are quite similar. I'd love to visit the Philippines one day. Hey lovely post.Must follow Shulie on twitter too. How great to see Pepy here guest posting, I met her through Flickr a while ago. She's a very talented photographer and a lovely person. Such a cool post, exotic recipe and pretty photos. Beautiful guest post and a perfect fit on your blog! These sweet fritters sound awesome, especially with that coconut sugar. I love the exchange of cultural ideas and the gastronomy sharing. This is what a food blogger community should always be about. I have yet to try an Indonesian dish and a snack or a treat is great way to start with. Great job ladies. It is indeed refreshing to see guest posts like this one! Look at those fritters! I have some Coconut Sugar at home... I'll have to make these! To all who already knew before, thank you for very nice comments here. @Sanctified Space & Malou: Nice to meet you here. Thank you everyone, happy to introduce Pepy and Indonesian cuisine to those that are new to it. Those of you who are familiar I am happy this was a trip down memory lane. I feel as though this fritters transcend through cultural barriers. So relatable! Well, I learned about a new ingredient! These sound wonderful and so easy. Great post! Awesome guest post! Love your site always for something to learn and of interest. Happy Passover to you! These look wonderful! I'm intrigued by the coconut sugar-I'm going to have to track some down, for sure! Thx kat, Elle, Alison, Megan & @Torviewtoronto Pepy here left a link to coconut sugar explanation. Isn't it fascinating?! Must admit I never used it before, on my list for next grocery shopping! Well done, Pepy! This is a great post! I love cassava fritters and these stuffed ones look yum! This is my first visit to your blog and I am already in love with your space. Dropped here from Indonesia Eats and it was my first visit to her blog too. :D Two amazing blog discovery on one day ! I LOOOOOOVE cassava, or yuca as my familia calls it. I've enjoyed it since I was a little girl and am always looks for new and creative ways to cook with it. These fritters look and sound incredible delicious and will be coming out of my kitchen very soon! @Eliana: Looking forward to see it!